take a hike. If you’re in the United States this coming week, consider taking advantage of the annual free admission to over 400 U.S. national parks during National Park Week from April 22-26, 2013. Cast your net a little wider by supporting your local Earth Day events. Or go global in your impact by donating to the Canopy Project – each dollar plants a tree in an impoverished place on our planet, helping protect the earth from soil erosion and so much more. Help the Canopy Project plant 10 million trees over the next five years. Green-lovin’ Jaden Smith, 14-year-old son of Will Smith & Jada Pinkett Smith, introduces this Earth Day Network project in this video. Finally, celebrate with your tender saplings whatever you did so they know how important and appreciated their efforts are. Kindness, respect, and responsibility to the earth are wonderful virtues to cultivate in your little ones. Give them hugs on behalf of Mother Earth and find a creative way to thank them. 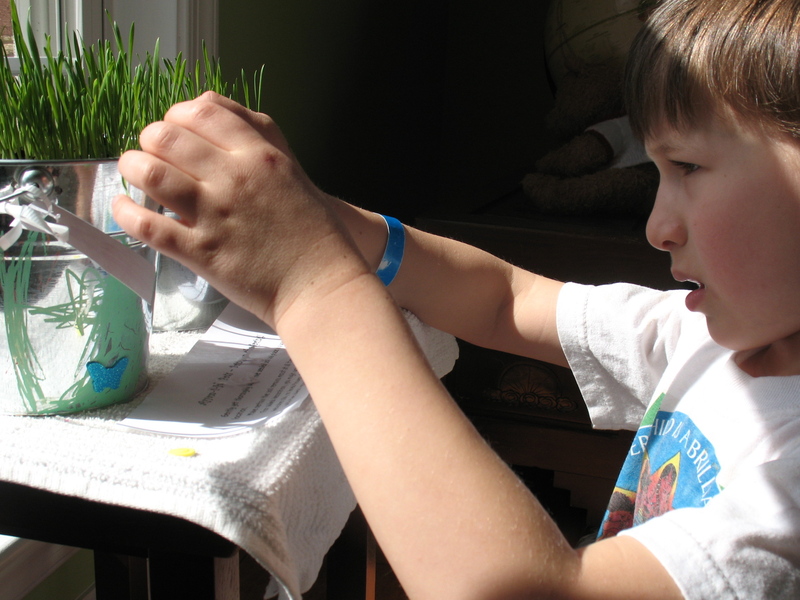 Here’s a fun crafty activity that helps them enjoy growing something green right on their windowsill. This is an idea from the activity tag that comes with all our Tender Sapling line of textile products. Decorate a small metal or ceramic pot with paints, markers, stickers, or ribbons. Fill the bottom of the pot with stones. Add potting soil to near the top of the pot. Sprinkle wheatberry seeds (available at natural food stores) generously on the soil. Cover with a little bit more soil and moisten. Place in the sun and spray or lightly water every day, keeping it moist. Watch the “grass” grow within a few days! Kids love giving their grass a haircut with scissors. Have fun! Grow noble! What will you do for Earth Day? What are ways you cultivate or celebrate sustainability in your children?